How much does it cost to travel to Amsterdam? How much money will you need in Amsterdam? €126 ($141) is the average daily price for traveling in Amsterdam. The average price of food for one day is €31 ($34). The average price of a hotel for a couple is €147 ($166). Additional pricing is in the table below. These average travel prices have been collected from other travelers to help you plan your own travel budget. How much money do I need for Amsterdam? 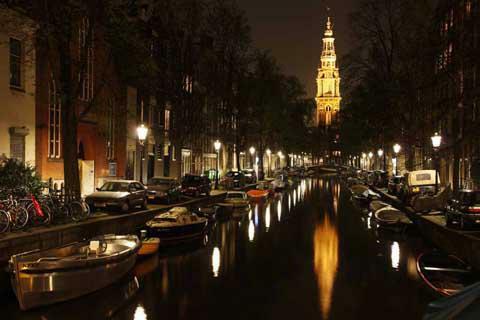 Amsterdam is the capital, and most popular tourist destination in the Netherlands. There are over one million residents in the metro area. Amsterdam is most famous for its canals that criss cross across the city, but it also has a rich history, interesting culture, and liberal vibe that appeal to all types of travelers. The architecture, bridges, and cycling culture help this metropolitan area maintain its small town vibe, despite being the largest city in the country as well as the financial center. A visit to Amsterdam often includes at least one side trip into the countryside. A visit to a small town outside of the city will let travelers see the tulips (when in season), visit the windmills so popular in the Netherlands, and explore the local communities that are so friendly and welcoming. These small towns are a great where to see more of the Netherlands than just Amsterdam. Visiting Amsterdam is all about the atmosphere, but there are also many famous sights that are worth checking out. These include the many bridges and canals. Make a point of just wandering around town and enjoying the unique feel. Magere Brug is the best example of the traditional white draw bridges of the area. Also notable in Amsterdam is the many religious sights. The Esnoga is the most famous synagogue and there are many churches including Oude Kerk, Nieuwe Kerk Zuiderkerk, Noorderkerk, and Westerkerk. Popular museums include the Anne Frank House, Rijksmuseum, Van Gogh Museum, and Nieuw Dakota. If you plan on visiting many of the city's museums, a museum card may be beneficial. This will allow you access to over 400 museums throughout the country. If you want to enjoy a picnic outside, head to the popular park, Vondelpark, in the southern area of the central city. Amsterdam's Red Light District is also a popular tourist sight. Visitors to Amsterdam most often come to see the city's Old Centre. This medieval center has the most interesting and traditional architecture, the largest number of canals, plenty of shopping opportunities, and a good number of Amsterdam's infamous coffeeshops. The very center of this neighborhood is Dam Square, but other interesting parts are Nieuwmarkt, Spui, and, of course, the Red Light District. Another interesting neighborhood is the wealthy Canal Ring. This neighborhood is a UNESCO World Heritage Site and has several celebrity residents. This is also a neighborhood to visit if you're looking for good nightlife. Other interesting, but less visited neighborhoods include Jordaan, where there are many local art galleries, restaurants, and boutiques, Plantage, where you'll find the highest concentration of museums, and in the South you'll find museums, the Albert Cuyp Market, and affordable accommodation. Canal Cruises in Amsterdam are a popular tourist activity. There are a handful of companies that run cruises throughout the city center. Popular festivals in town include King's Day, which is the national holiday on April 27th. The whole city shows up in orange and there are flea markets, bands, and vendors throughout the city. The Tulip festival in May is popular outside of town in Noordoostpolder and the Holland Festival is a performing arts festival in June that is world renowned. The Amsterdam Light Festival is a great way to celebrate the holidays in December. See also: Amsterdam itinerary 3 days. Restaurants can be quite expensive in Amsterdam. If you're on a tight budget, the many Asian restaurants around town may be your best bet. In particular, Indonesian food is quite popular and very good. Most of the Asian restaurants are found in Nieuwmarkt at the Zeedijk, which has been called Amsterdam's Chinatown. Damstraat has many smaller and affordable ethnic restaurants that are usually Chinese or Middle Eastern. In the touristy areas of the city center you will pay a premium for lower quality food, so these are best avoided. There are also many supermarkets around town where you can pick up local cheese, bread, fruits and meat and enjoy a picnic by the canals. Head to Albert Cuyp market, Dappermarket, or any of the local cheese shops for the best cheeses. Ossenworst is a popular sausage that is originally from Amsterdam. A herring sandwich is also a local favorite and can be bought at the fish stand near the Flower Market. If you're exploring the city center, you can walk almost anywhere. It is very compact and incredibly flat. There is public transportation that is convenient and efficient if you are traveling outside of the city center. The tram is operated by the GVB and is available in the central part of the city. Buses travel to the further outskirts of town. A four line metro system is also available that serves the neighborhoods in the southeast. Amsterdam is also famous for its many cyclists. It's possible to rent a bike and explore town like the locals do. This is, perhaps, one of the most enjoyable ways to see Amsterdam. If you're traveling with another person it's often the same price (or sometimes cheaper) to go ahead and get a double instead of staying in a hostel. Unless you're looking for the hostel atmosphere, you're likely to get more bang for your buck with a small, basic double room. Just a heads up that one draw for many tourists to Amsterdam is no more. It is know longer legal for foreigners to smoke pot, even in the bars you'll find around Amsterdam. While locals can still legally get high, foreigners are no longer allowed to. Keep this in mine when planning your trip. The new law is being taken seriously, so don't let any surprises ruin your vacation.